This module builds on learning achieved in both the level one by providing an opportunity to apply theoretical knowledge to organisation practise. This is achieved by students working in small teams on a real time consultancy project which takes place in a variety of public, private and voluntary sector organisations. It gives the student the responsibility of managing themselves, their time, their team relationships and their relationships with external clients to achieve outcomes of real significance to the organisation. - Deliver a persuasive oral presentation to the client et al. There are four elements to this assessment process which reflect the nature of the teaching and learning taking place. 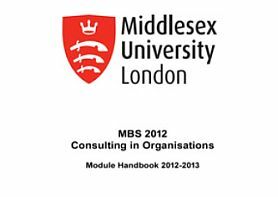 In addition the module handbook contains a significant amount of material and further materials, such as previous client reports.